Philadelphia 76ers guard Jimmy Butler (23) checks the bench for the play during the first quarter against the Orlando Magic at Amway Center. It wouldn't be the Sixers if they came out and left little doubt about their future together. On the night of Jimmy Butler's big debut, Philadelphia fell to the Orlando Magic in a game that featured a 21-0 run to flip the game in the second half. Not great. We'll get more in-depth on this one tomorrow, but for now, here are the rapid-fire thoughts of what took place out there on Wednesday night. • Jimmy Butler is a member of the 76ers. That is a pretty objectively good thing. • Butler's arrival potentially means everyone takes a step back in the organization. When you bring an established star to a team still trying to find its footing, the power structure comes into question. I'll tell you who doesn't seem fazed by his arrival: Mr. Joel Embiid. All he did in the opening stretch with Butler was morph into the 7-foot-2 version of Steph Curry, brutalizing Orlando for 11 points in less than half a quarter. You would never be able to tell he has struggled with inconsistency from deep for most of the last couple seasons. With Embiid on the floor in the opening stretch of basketball, everything ran through the big man. Even Butler's first basket, a nice layup off a cut, came from an assist tossed by his center. No one is taking Embiid's ownership of this team away. • Dominant as Embiid was to start the game, Butler certainly made his presence felt on the offensive side of the ball. And the most encouraging sign from the All-Star wing? The vast majority of his damage was done without the ball in his hands. 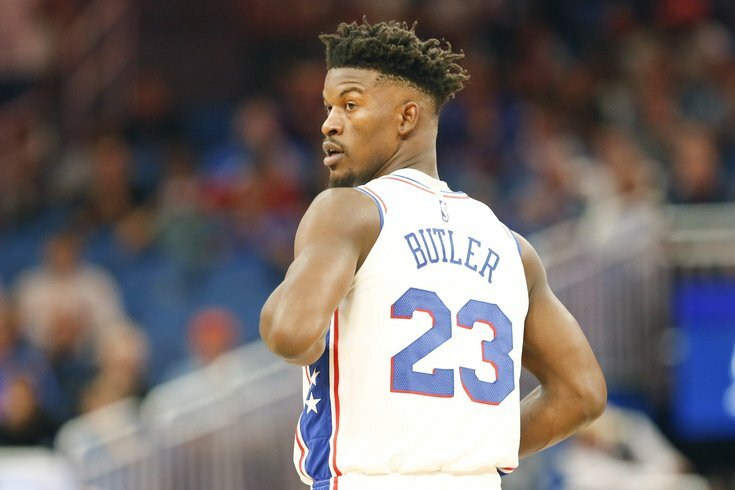 Butler has always been capable of playing off-ball, but he has the talent with the ball in his hands that most of his teams never weaponized him that way. But even when he wasn't scoring — six of Butler's eight first-quarter points came directly from off-ball movement — he kept himself on the move, providing options or at least activity around Embiid as he went to work. That's a welcome sight on this team, to say nothing of his ability to hit shots off the dribble. • Say this about Furkan Korkmaz, regardless of whether you're a believer — the kid stayed ready for his opportunity while spending most of his time in the NBA deep on Philadelphia's bench. He has stepped up in a big way over the last few games, providing the Sixers some shake and shooting off the bench. One of the most encouraging plays of the first half featured a connection between the franchise big man and Korkmaz. Embiid, who is a great passer when he's feeling a certain rhythm in the post, made a quick read to Korkmaz in the corner, who has a quick enough release to let it fly and hit from deep even when the defense is tight. These plays are important for Embiid. His passing and decision making have improved this season and make him even better in the post. It's far too early to say the Sixers made a mistake declining his third-year option, because plenty of bad players have had nice stretches for three games. Timothe Luwawu-Cabarrot was a revelation during a brief period as a starter with JJ Redick hurt last season, and nobody misses him much. Still, Korkmaz's development is a storyline to watch as the season winds on. And while we're on the subject, what a game for Embiid as a passer. He came up with his first career triple-double, and he had it all going in Orlando, showing he's a weapon even when the shots aren't falling. • There are some defensive kinks to be worked out and turnovers that still need to be cut down, but this is the best Philadelphia's offense has looked all year. Spoiler alert: when you add a very good offensive player, it turns out that has an impact on the team's offense. • Whether Markelle Fultz would respond positively to being moved to the bench was an open question coming into tonight's game. Who knows what his role will look like long-term, but he got the job done by just staying within himself and taking advantage of any small holes in Orlando's defense. He crashed the offensive glass, hit a couple jumpers, and kept the second-unit humming without Simmons on the floor. Fultz just looks so much more comfortable when he can run the offense on his own, and when he has a more spread floor around him. He and Simmons both have a negative effect on each other, making it tough for Fultz to build any sort of momentum and for Simmons to build on his rookie year. Assertiveness stems from confidence, and confidence comes from feeling comfortable. There's absolutely no doubt in anyone's mind that Fultz feels most comfortable as a point guard, which Brown re-asserted was his best current position before the game on Monday. Empowering him to be his best self might mean you need to maximize his minutes running the show with more shooting around him and Simmons on the pine. Empowering Fultz doesn't mean you need to force feed the Simmons/Fultz pairing before they're really ready to run together. Growing his comfort and confidence at the NBA level should be priority No. 1 — it is the foundation of all that he may become. What Fultz's success as a second-unit player ultimately means is up for debate. Does that turn him into a really good weapon off the pine for Philadelphia, or force both parties to recognize they'd be better off apart? Tough to say. For now, the Sixers will always treasure good minutes and good energy from Fultz, and he looked natural as he ever has on an NBA floor. • How about Wilson Chandler, the man who has barely been able to show his stuff this year, stepping up with the game on the line in the fourth quarter? He came up with some monster buckets for Philadelphia when things got hairy, and threw down a hellacious slam that punctuated a nine-point outburst in the middle of the fourth quarter. Having competent wings is a luxury the Sixers really haven't had in a long time. If they can get another one that either pushes Chandler into a bench role or at least competes with him for minutes, they're really going to be cooking with gas. • Butler's addition was supposed to spell the end of crunch-time troubles, but a lot of people expected that to be strictly through his own offense. The beauty of his game is that he can use the threat of his scoring to find other players with better matchups or guys who find themselves wide open because of doubles they're sending elsewhere. Mike Muscala was the beneficiary on a couple different possessions late in the fourth, taking wide-open shots from deep out of pick-and-rolls involving Butler. • There was a 1:05 stretch in the first quarter where none of Embiid, Simmons, or Butler were on the floor for the Sixers. That should not happen. • Nearly every minute Amir Johnson plays as a backup center is killing the Sixers this season. He didn't handle nice interior passes from Butler, didn't do anything to stop Nik Vucevic in the post, and isn't helping make life easier for pretty much anyone on the court. Brown keeps experimenting with small-ball units, and even ran out a look featuring Wilson Chandler at center in the second quarter on Wednesday night. I don't care how you get there, Johnson has to take a seat. • You add an All-Star to the mix, you would think the huge blown leads might stop. Nope! The Magic ripped off a 19-0 run at the start of the fourth quarter, which should be virtually impossible for a team with their personnel to do. Some of that you just have to tip your cap on — Terrence Ross just kept pulling up and knocking down threes, and you can't really prepare for that — but there's no excuse for a team with this personnel to stagnate long enough for them to come back and seize control of the game. Brett Brown is going to come under more scrutiny than ever if these outbursts continue with Butler in the fold, and rightfully so. • The other major pieces seemed to adapt just fine to the new setup, and it's clearly in Ben Simmons' court to figure things out on offense. His lack of a jumper is only going to look more glaring over time, and he was mediocre to bad at pretty much everything on Wednesday night. Not only was Simmons not impactful on his own, but he also ended up getting in the way of Butler during several potential opportunities around the basket. He likes to hang in the dunker's spot, but he's going to have to figure out a way to stay involved off-ball as a cutter or a spot-up guy from midrange, lest it screws things up for their more well-rounded players on offense. I thought his ineffectiveness defensively was even more notable, specifically because he was asked to do less on offense for a lot of the game. He got beat on a few plays that simple attentiveness would have prevented, and he simply has to be better there for the Sixers to be the team they aspire to be. • Speaking of Simmons, I don't really understand why Simmons was trusted with the ball in his hands for so much of the fourth quarter. You brought Butler here in part to be the go-to guy in crunch time, and you're relegating him to being a non-factor for stretches of winning time. The excuse of not having someone you can trust with the ball in their hands is out the window. The Sixers won't be able to lean in the excuse of Butler's newness for long. It doesn't take mastery of the playbook to know who should have the ball when it counts. • There are always good vibes on the night of a big debut for a star player, so we'll refrain from calling anything ugly tonight. Treasure the optimism before the adversity hits, folks.